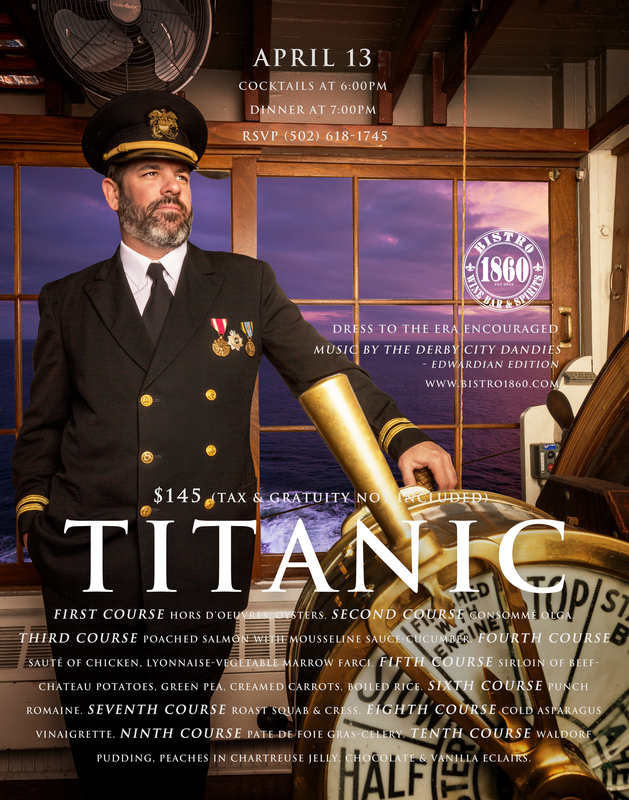 Just one look at the 10-course menu for Bistro 1860s Thursday night Titanic dinner evokes a twist on that famous line from the movie “Jaws”: You’re gonna need a bigger gut. It is a full-on heapin’ helpin’ of food and history all in a single spot. The Thursday night dinner, which starts with a 6 p.m. cocktail hour followed by dinner at 7, is one in a long string of themed meals done at the restaurant. At 10 courses, the Titanic event could rival the three-hour table time logged at last year’s Death Row Dinner, a 12-course belt busting, diet-wrecking repast, but Crouch is predicting it can be done in less. No matter how you cut it, guests will need to block out a lot of time. By modern standards, the menu (click here to see the full lineup) is far from daring, but preparing those classics well is no mean feat. Crouch, a chef not prone to following defined technique, will go old school in cooking the food appropriately to the period. He said he also wants diners to enjoy traveling back in time to get a feel for what upscale dining was like 105 years ago. And one can certainly do that digging into dishes like consommé Olga; cream of barley; chicken Lyonnaise; vegetable marrow farcie; roast duckling with apple sauce; and peaches in chartreuse jelly. Though the Titanic’s first-class passengers enjoyed wines paired with each course, he chose not to do that to “avoid any sticker shock.” And given that the cost of the dinner is $145, sans tax and gratuity, one can see what he means. Still, if someone simply must have 10 pairings, they can choose from a suggested list to be shared that night. For the event, Crouch said the dining room’s tables will be decorated with tablecloths, napery and flowers exactly like those seen in photos from the Titanic. He’ll have a live string quartet playing throughout dinner—“Maybe I’ll make them wear life jackets,” he joked—and all guests are encouraged to wear period-correct clothing. “I want make it as exact as possible without the death,” Crouch said. Asked if he’d wear the captain’s uniform he wore in the photo for the event’s advertising, Crouch laughed and said no. To make reservations, call 502-618-1745. The restaurant is located 1765 Mellwood Ave. This entry was posted in Eat, Entertainment, Louisville Restaurants and tagged Bistro 1860, Michael Crouch, Titanic dinner.